I've teamed up with Banza Pasta (made from chickpeas) to give you a yummy plant-based recipe that's vegan, high in protein, & gluten-free! The true measure of the integrity of a gluten-free pasta is how it holds up in a chilled state. So I whipped up this salad, refrigerated it for several hours, and kept my fingers crossed. Banza did not disappoint! No soggy fragile noodles to be found! This pasta is much higher in protein than others (thanks to those beans). More protein equates to a more filling meal or side dish! Look for it at your local grocery (Target or Thrive Market online carry it as well). Bring 8 cups of water to a boil. Add pasta, bring to a boil, then reduce heat to medium high and cook for 7 minutes (do not overcook). Drain and rinse with cold water immediately. 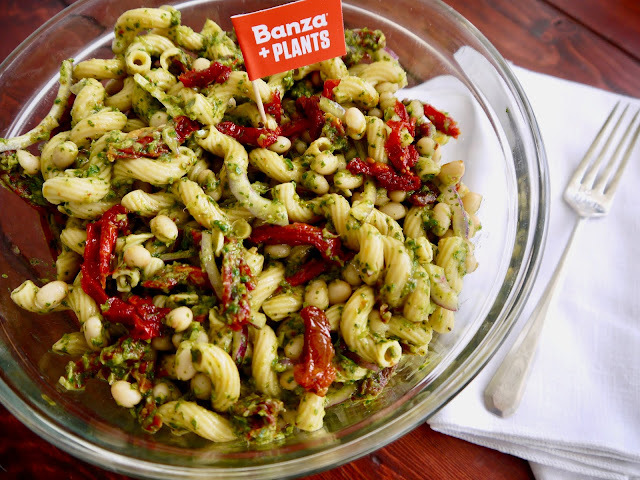 Add pasta to a large bowl and toss gently with white beans, sun-dried tomatoes, and red onion. Combine chimichurri ingredients in a large food processor. Mix until a smooth puree is formed. Spoon chimichurri over the salad ingredients and gently stir to coat. Cover and refrigerate for one hour, or until ready to serve.